Keeping elderly patients safe from burn trauma can be a challenge. However, preventive education and collaboration with families and other practitioners can result in improved burn safety. Experience has shown that children are amazingly resilient burn patients. They heal remarkably well and dive into grueling therapy regimens with inspiring gusto. Young adults grit their teeth and gut it out in order to get back to work and continue providing for their families. Elderly burn patients, however, have the hardest time. There's a lot working against them—heart disease, emphysema, diabetes, kidney disease, arthritis, and other chronic conditions—that makes healing difficult. And it can be more troublesome for older adults to perform the hard physical work required to survive and enjoy a continued high quality of life. Every year, approximately 1,200 individuals aged 65 and older die as a result of fire, often from clothing catching fire and scalding burns from hot water and grease.5 The National Fire Protection Association lists five primary causes for burn deaths and injuries among older adults: smoking, cooking, scalding, electrical wiring, and heater mishaps. As a result, there is an ever-increasing need to recognize, evaluate, and address injury risks for older adults by advancing dedicated geriatric care and focusing on education and prevention. With age, physical and cognitive changes can play a role in the level of risk and related mortality of our patients. Common factors such as changes in vision, hearing, and sensation; decreased mobility and dexterity; as well as medications and medical conditions can put these older adults at risk. For example, diminished eyesight can lead to an older patient failing to realize a stove burner remains on. Smoke alarms may not be heard in the absence of hearing aids, delaying recognition of a fire. With age, the skin thins and elasticity decreases from less subcutaneous fat, resulting in deeper, more severe burn injuries. Medical factors, such as peripheral neuropathy, can cause older patients to fail to realize they have been burned until it is too late. In a fast-moving fire, it is easy for an older adult to become confused and succumb to smoke or flame before reaching safety. To meet these challenges, we must first advance the level and focus of geriatric care. Ten to 15 years ago, many hospitals did not have a dedicated rotation in geriatrics. Now hospitals are beginning to implement requirements for their practitioners to become accredited in geriatric care, ensuring personalized service for every type of patient. For example, Sentara Healthcare recently established an Acute Care for Elders (ACE) unit at one of its hospitals. This unit specially trains and educates physicians, nurses—specifically Nurses Improving Care for Health System Elders, physical and occupational therapists, and speech-language pathologists to provide comprehensive specialized care for seniors. ACE's focus on outcomes includes a wide-ranging approach to medication safety, preventing functional decline and falls, maintaining skin integrity, and pain management to foster self-care and independence. In the case of a burn injury in the Virginia and North Carolina region, patients are taken to the Level I Trauma Center and regional burn center at Sentara Norfolk General Hospital. Reaching a trauma center has proven to increase a seriously injured patient's chances of survival by an estimated 20% to 25%.1 Last year alone, the trauma center treated more than 170 burn patients from Virginia and North Carolina, with 16 among them aged 65 or older, who had suffered from burn injuries caused by flames, grease, and scalding. Partnerships with like-minded organizations allow for the exchange of high-level geriatric knowledge and best practices. One such example is Sentara's affiliation with Eastern Virginia Medical School's Glennan Center for Geriatrics and Gerontology. Such collaborations can help older patients maintain quality of life through compassionate care and take advantage of research involving age-related diseases and disabilities as well as prevention. Understandably, many older adults want to maintain their independence. Focusing on safety awareness and education for older adults can help prevent fire-related injuries and deaths. However, we must also work with family members and caregivers to ensure that prevention methods are established and maintained in the home. Family members often feel guilt-ridden after a burn incident. Families can help prevent burn injuries by conducting home inspections to help older adults understand how they can better protect themselves. For example, are there tripping hazards blocking an escape route? Are smoke alarms fully functional and at a volume and frequency that elders can hear, even without a hearing aid? Are older adults smoking in the house? Worse, are they smoking in the presence of home oxygen therapy, which is a recipe for disaster? Such issues need to be addressed forthrightly. 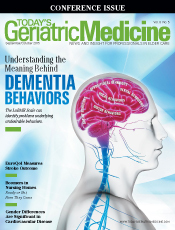 Assessing the cognitive and functional status of older adults is also key in evaluating risk. Consider how older adults think about fire, as misperceptions could place them at higher risk for injury and death. Commonly, patients blame their burns on a one-time accident that is unlikely to happen again. However, is there a pattern of behavior that makes another burn incident likely? Other preventive techniques that can help keep older adults safe include keeping the home's hot water temperature below 120° F for bathing and washing dishes, and using memory prompts such as alarms to turn off the stove. Avoiding robes and other loose clothing around the stove, cooking only on rear burners, and keeping pets and grandchildren out of the kitchen or at a safe distance to prevent tripping and falling with hot pots can also prevent burns to both the young and the elderly. In bedrooms, older adults should keep a telephone, eyeglasses, hearing aids, and a flashlight within easy reach of their beds, and ensure clear exit routes. Additionally, it's essential to ensure that space heaters are a safe distance from curtains and bedding. It's also wise to have a smoke alarm in the bedroom as well as in the hallway outside. Burn safety education promotes greater awareness among older adults and helps them avoid unnecessary trauma and painful burns. As health care providers, we must go above and beyond to educate patients and their families about burn and fire safety, and collaborate with each other to improve patient care. In doing so, we are helping to ensure our patients are better equipped to live safer, burn-free lives, a mission that embodies why we do what we do. — Jay Collins, MD, is the medical director of Trauma Sentara Norfolk General Hospital and chief of the Eastern Virginia Medical School's Trauma and Critical Care. 2. Colby SL, Ortman JM. Projections of the size and composition of the US population: 2014 to 2060. US Census Bureau website. https://www.census.gov/content/dam/Census/library/publications/2015/demo/p25-1143.pdf. March 2015. 3. Ortman JM, Velkoff VA, Hogan H. An aging nation: the older population in the United States. US Census Bureau website. https://www.census.gov/prod/2014pubs/p25-1140.pdf. May 2014. 5. Topical Fire Report Series: Fire risk to older adults in 2010. US Fire Administration website. https://www.usfa.fema.gov/downloads/pdf/statistics/v14i9.pdf. August 2013.